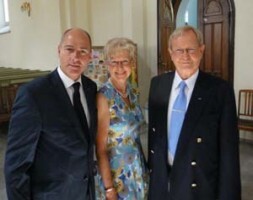 Dr. Hubertus Hoffmann, President of the World Security Network Foundation (WSN), with Tunne Kelam (right), member of the International Advisory Board of WSN, and his wife Ann-Mari: "The foundation for Estonia’s success story was radical reform from the beginning. Today Estonia is a member of the EU and NATO (2004) and since the beginning of this year in the euro zone as well. It has always been always very keen to shoulder its responsibilities and at the same time actively participate in international crisis management. When it became independent in 1991 more than 30 percent of the population were Russian. Ever since the relationship between ethnic Estonians and Russians has improved and the animosity of the Soviet time has vanished. Estonia and the two other Baltic states can play a key role in promoting free movement between the European Union and the Russian Federation in both directions." Tunne Kelam experienced the harsh and cold times of Soviet occupation, became a leader of the independence movement in the 1980’s and 90’s and today represents his country at the Baltic Sea in the European Parliament. He recently celebrated his 75th birthday in Tallinn. Freedom heroes like him know how bitter dictatorships and how sweet freedom tastes and what the recipes are to transform a rotten dictatorship into a flourishing and sustainable governance model. When he launched the Eeesti Kongress (Congress of Estonia) in February 1990 after the Citizens' Committees Movement had registered 790,000 persons as legal citizens of the Estonian Republic, 31 parties and movements founded a first free counter-parliament against the communist parliament in the smallest republic of the USSR. Tunne Kelam and his friends like Mart Laar moved their people towards a brighter future. Today, Estonia is a member of the EU and NATO (2004) and since the beginning of this year in the euro zone as well. In the early 1990’s I had the privilege to chair the International Advisory Board for Tunne Kelam and his Estonian Congress which proposed radical reforms as a "jump into modern Europe" embedded into the "Baltic Hanseatic Region". We suggested to interlink the new Estonian Kroon to the Deutsche Mark, implemented in 1992 as a solid base for economic stability. European MP Tunne Kelam, also a member of the International Advisory Board of the World Security Network, argues in his WSN TV interview that the foundation for Estonia's success story were “radical reforms from the beginning”, including complete privatization. Estonia did not ask for too many loans and actively engaged its pluralistic society, consisting of a broad range of political movements. The small country of only 1.4 million people concentrated on national goals. The country started from the ruins of a rotten Soviet system. Thanks to committed free-market and pro-business reforms Estonia today has a prosperous economy and bright looking future . Nigel Williams, Managing Partner of Royalton Partners, former Chairman of Starman, Estonia's leading Cable TV provider and a member of the WSN International Advisory Board, points to the important integration into the Euro Zone: ”Estonia became the 17th Euro zone member in January 2011, the third of the ex-communist countries after Slovenia and Slovakia to join the common currency. Estonia's strong connection to the Nordic economies has underpinned a significant economic recovery, with projected GDP growth of 4.5 percent for 2011. With a near budget balance the country continues to outperform the other Baltic states." During the last 20 years Estonia increased its GDP per capita more than fivefold to ca. US $ 19,000. Before the worldwide economic downturn in 2008, the average rate of economic growth was seven percent a year. Its public debt as percentage of GDP stands at roughly eight percent only. Infant mortality decreased fourfold and 90 percent of children attend secondary school. Some of the recent movements in North Africa have mentioned the Estonian model and according to Tunne Kelam now need European support focussing on the new democratic movements promoting the rule of law. The crisis in Europe should be overcome by addressing the “crisis of values”, that is living at the expense of our grandchildren and an imbalance between income and spending. The moral is that Europe needs stronger institutions with automatic sanctions if rules are violated by nation states. One of the political focuses of Tunne Kelam in the European Parliament is the democratic development in Russia “which concerns all of Europe”. He argues the soft factors have been pushed down in the agenda that is dominated by economic interests. Europe is too often only reacting to Russian moves. The EU-Russia relationship has to be balanced by “conditionality”, including transparency for foreign investors. Russians deserve the same level of freedom as Hungarians, Estonians or Poles and Moscow must act against bribery and attach greater priority to the rule of law and transparency. Nobody should think that Russia is not ready for democracy - this would be racism. Mart Laar, co-leader of the independence movement in the mid 1980’s, Prime Minister from 1992 to 1994 and 1999 to 2002, and currently Defense Minister, adresses the Russian occupation starting 1939/40 when Estonia lost 20 percent of her population and hundreds of thousands of Russians moved into the country. When it became independent in 1991 more than 30 percent of the population were Russian. Ever since the relationship between ethnic Estonians and Russians has improved and the animosity of the Soviet time has vanished. The new generation lives in a changed and modern society. The school systems are integrated and many Russians have been applying for Estonian citizenship to attain EU citizenship rights. The Russian Ambassador to Estonia, Yuri N. Merzlyakov, has been working to improve the relationship, especially with St. Petersburg and the northwest of the Russian Federation. Mart Laar demands that Russia must open its archives not only for Estonia but also for Russian historians. The facts should not be hidden anymore and the cold time of the USSR and the cruelties of the Soviet regime should be analyzed, discussed and digested. This is still missing as Mari-Liis Põder who works as a lawyer and reserve officer in the Estonian Army and as WSN Editor Estonia explains: “The dramatic history has left a deep wound within the small nation of Estonia that we have to try to overcome. I am afraid that we cannot do so without looking back at the wrong done in Second World War. Although Estonia is now member of NATO and the EU, the nation is still suspicious at heart about having to stand alone once again.” If Russia does not confront its past there is no future for justice and democracy, Mart Laar argues. The idea of a restoration of the Soviet Empire and the description of the fall of the USSR as “the biggest catastrophe in the 20th century” must be overcome with new thinking. A new dialogue should now start to revitalise the relations after the Bronze Soldier, a Soviet war statue perceived by most Estonians as a symbol of oppression and suffering was removed from the center of Tallinn and re-erected at the Russian war cemetery in the outskirts of the city in 2006, followed by a cyber-attack from unofficial Russian sources. Today, Russia is interested to improve its relationship with the EU where the three Baltic states are firmly integrated, including a visa-free travel agreement. Estonia and the two other Baltic states can play a key role in promoting free movement between the European Union and the Russian Federation in both directions and prove their dedication to contribute to the improvement of the relationship between the actors, between state officials, between businesses and most importantly between the people. The three Baltic states should become a more important bridge to Europe, a platform for mutual exchange for northern, eastern, western, and southern neighbors. Estonia is a best practice example for the transformation into a modern democratic society and a lighthouse of freedom at the Baltic Sea - maybe even for the progressive forces and the next elected president in Russia where real reforms are needed for progress within the next decades. Otherwise it will lose touch to the dynamic growth in Asia and Western Europe. This WSN Newsletter is dedicated to our late Member of the International Advisory Board Ronald D. Asmus who was a strong promoter of the independence and integration of the Baltic states into the EU and NATO and an excellent networker for a safer world.